Michele and I have decided to have more dinners at home and invite friends to join us. This weekend, we invited old friends, wine writer Tom Maresca and food writer Diane Darrow. Tom said he was bringing a “surprise“ red wine and was sure that I would like it. Champagne Deutz Rose NV (AŸ) made from 75% Pinot Noir and 25% Chardonnay. It has hints of red berries, strawberries and raspberries with a touch of cherry. 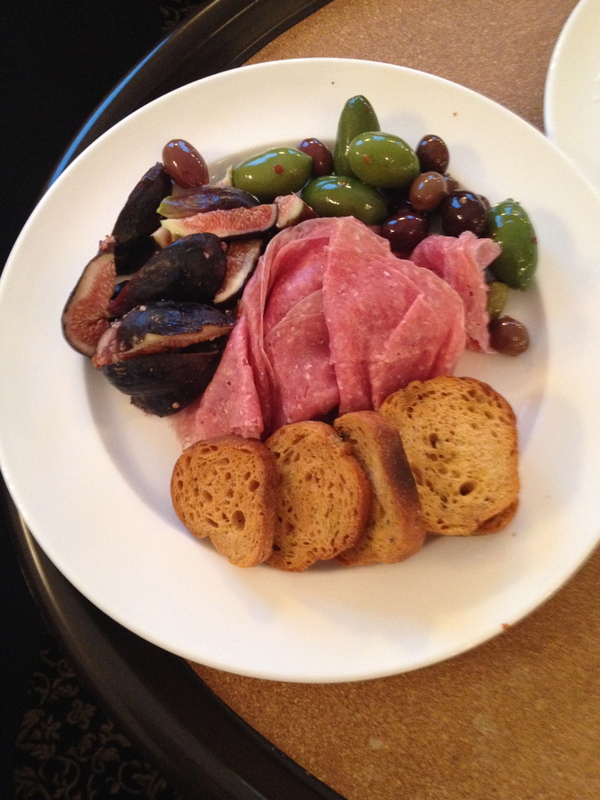 For a light starter, we had bites of sweet honeydew melon wrapped in prosciutto, plus olives and Sicilian almonds. 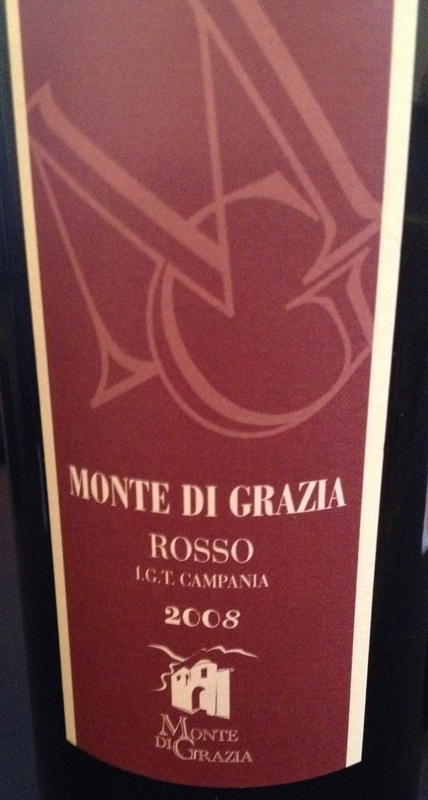 Monte di Grazia Rosso 2009 The wine is made from 90% Tintore di Tramonti from very old ungrafted vines and 10% Piedirosso. The Tintore di Tramonti grows almost exclusively in the Monte Lattari Valley. The grape is harvested at the end of September, which makes it an early ripener for this area. This indigenous red grape variety belongs to the Tienturier family. Tienturier means dyed or stained in French. The flesh and the juice of these grapes are red in color. The anthocyanin pigments accumulate in the grape berry itself. The free run juice is therefore red. This is a complex wine with earthly aromas, red fruit and a slight hint of black pepper and spice with good acidity that makes it a very good food wine. This wine has aging potential. I had the 2009 with the owner of the winery, Dr. Alfonso Arpino, on the Amalfi coast a few years and it may be the best wine he has made so far! 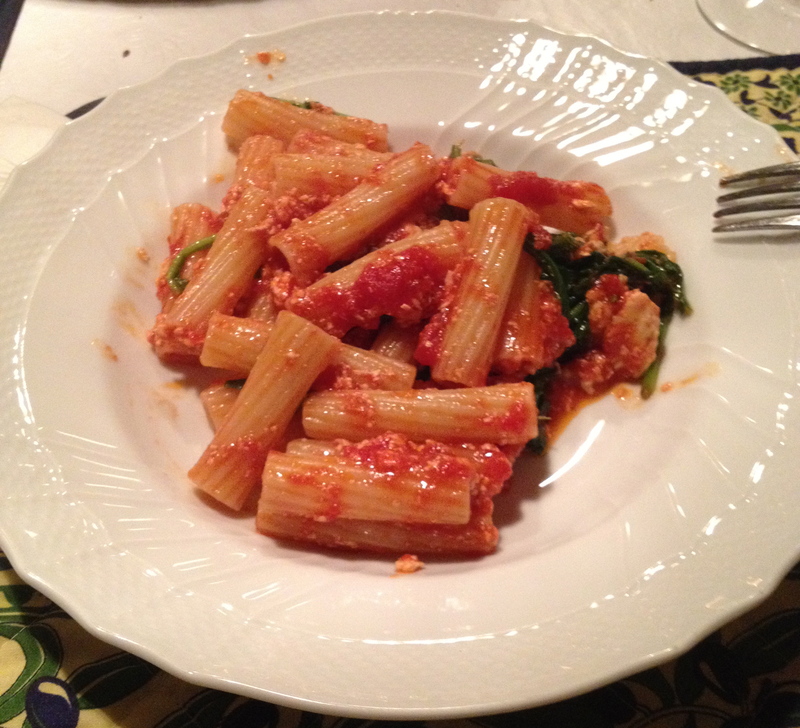 Our first course was Penne with Zucchini, a recipe from Tommaso Verdillo of Tommaso’s Restaurant in Brooklyn. It is made with a fresh tomato sauce, zucchini, prosciutto and pecorino romano cheese. I liked it so much, I ate three servings. Taurasi Radici 2000 Riserva 100% Aglianico Mastroberadino The soil is poor in organic substances but has a high content of clay, limestone, minerals and microelements. The vineyards are on two hills, Mirabella vineyard at 500 meters and the Montemarano vineyard at 550 meters. Because of its position on the hill and its altitude, the temperature at the Montemarano vineyard is much colder and the grapes are picked a little later. Harvest is from the end of October into the beginning of November. The vinification is the classic one for red wine, long maceration with skin contact at controlled temperatures. The wine spends one year in Slovenian oak barrels and two years in bottle, the wine can be laid down for 10 to 15 years. The riserva stays in medium sized 40 to 50HL oak casks for 2 years and 2 years in bottle. It can live in the bottle for 25-40 years. This is the way I believe the 1998 was produced. The wine was showing no signs of age. This is a full, complex wine with hints of black cherry, plum, spice, smoke and a touch of leather. Our second course was assorted grilled sausages: cheese and parsley, sweet Italian and goat chorizo, with a mixed tomato salad and potatoes fried with sweet peppers. Cabernet Sauvignon 1974 Dave Caparone – I first discovered the wines of Caparone a few months ago when Tom Maresca organized a tasting of their Nebbiolo, Sangiovese and Aglianico from the 2014 and 1996 vintage. Tom wrote to the winery about the 1974 and Marco Caparone asked his father Dave and this was the reply. “In 1973 decided to make wine. For 6 years I was an amateur winemaker working at home. During this period, I tried to learn as much as possible and I developed ideas about style and method that we still use today. The 1974 Cab was a product of those efforts. Of course, these amateur wines did not have the packaging format of commercial wines. That wine was bottled in 1976 and has not been recorked. The 1974 Cabernet Sauvignon, this was the surprise. Tom said it was sent to him from the Caparone winery as a gift with other wines he ordered. Tom was right, I really liked the wine. With the Cabernet Sauvignon we had two cheeses a soft and aromatic taleggio and a wedge of pecorino Toscano. This last is one of the most misunderstood cheeses I know. It’s a perfect cheese for eating and cooking, full of flavor and has none of the sharp saltiness associated with other pecorino cheeses. For dessert Michele made Grappa Brownies with chocolate chips and walnuts. These were dark and fudgy and not too sweet. She served them with raspberries and vanilla ice cream, but their flavor was so good, they could really stand alone. A glass of grappa was a perfect complement. Grappa La Trentina “Tradizional” – Grappa Giovane -Marzaddo Distillery– This is traditional grappa at its best. 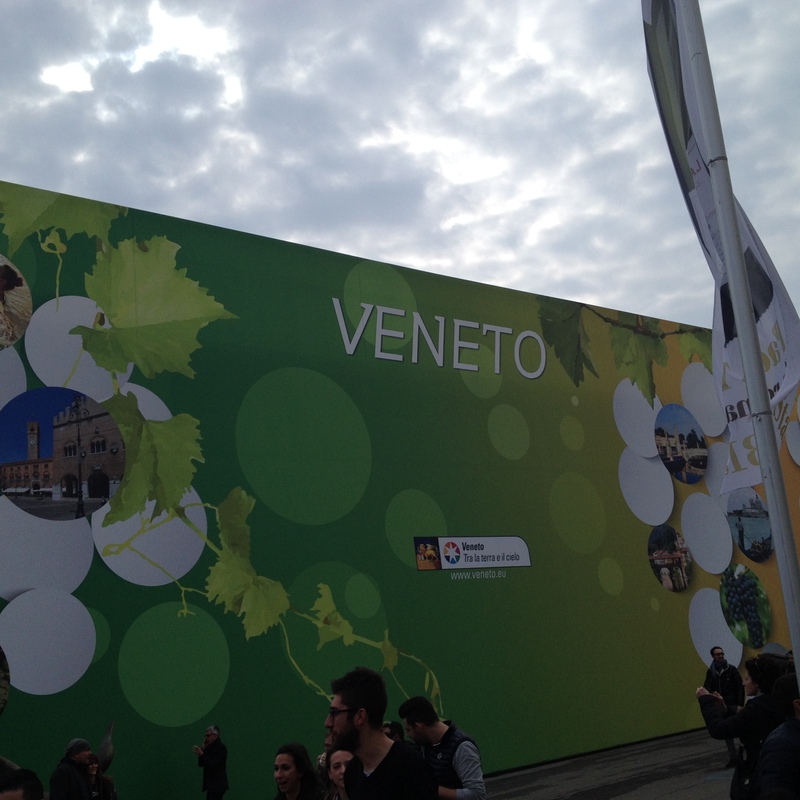 Vinitaly, the annual wine fair in Verona, Italy, is much bigger now than the last time I was there eight years ago. There are 12 very large pavilions and a number of smaller ones. The fair used to last 5 days, but now it is 4. 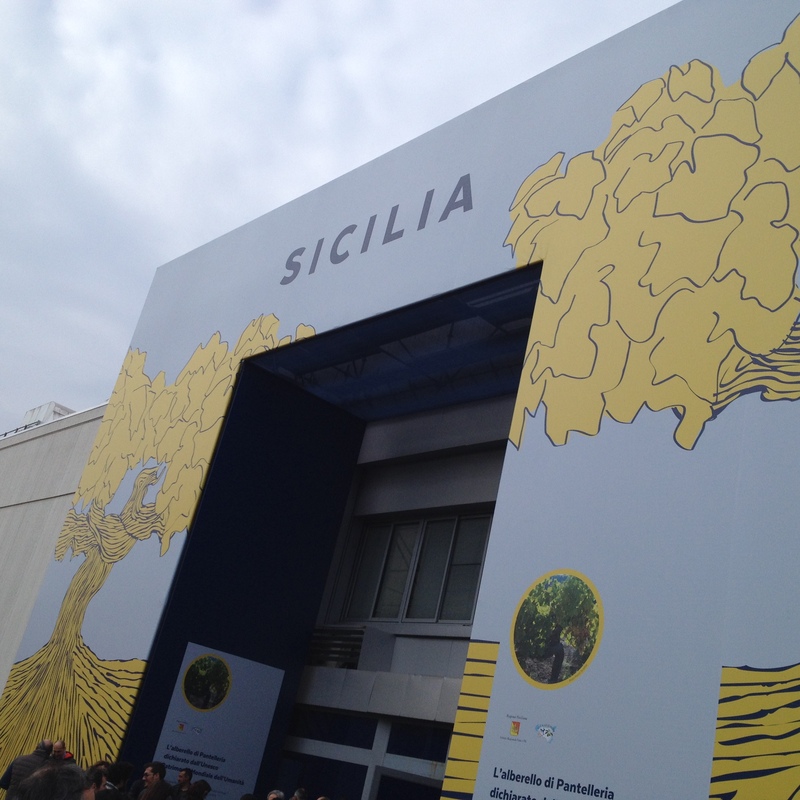 At least one wine writer, Alfonso Cevola, was disappointed at the state of affairs at Vinitaly and wrote what he called a “Dear John Letter.” He made some very good points on why he may not return to the fair–here is the link to the blog.https://charlesscicolone.wordpress.com/2015/03/28/alfonso-cevola-a-dear-john-letter-to-veronafiere/ While I agree with Alfonso on many points, there is another side of the fair, that of visiting and tasting wine with old friends and making new ones, that I think is the best part. Sunday was the first day and the most crowded. Our first visit was with Barbara De Rahm, a negotiant I have known for many years. 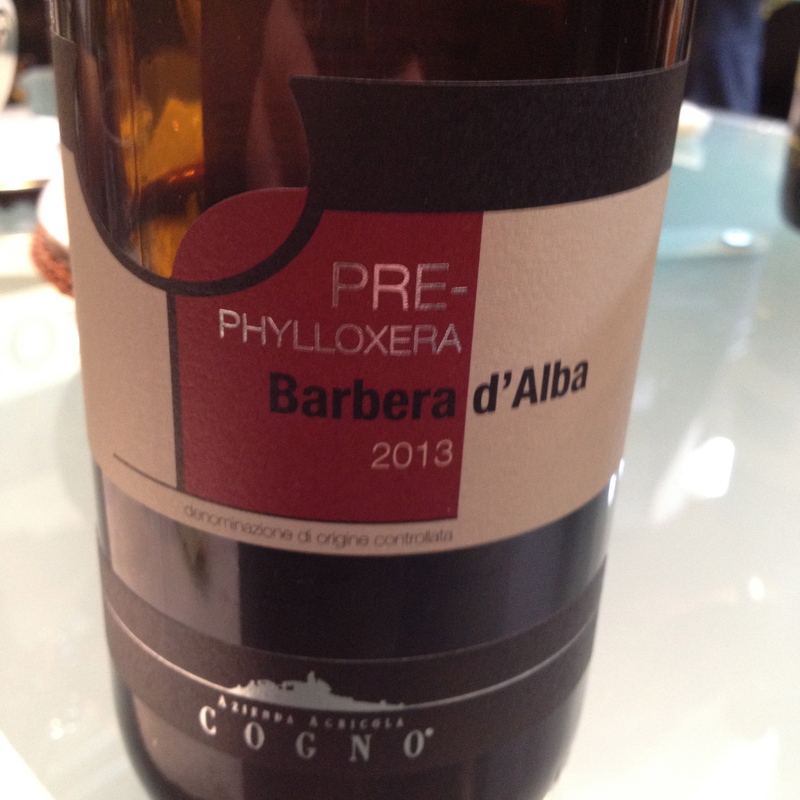 There was a time when I was the Wine Director at I Trulli that I would sit all day at Barbara’s stand tasting wine. The next stop was a visit and tasting with Valter Fissore and his wife Nadia Cogno of the Elvio Cogno winery. I have known Valter and Nadia for a number of years and like his style of wine. Travis and Nicole, the owners of Turtledove Wines and my travelling companions, like these wines and have a large selection in their store. Next we stopped by to see Luca Currado of the Vietti winery who I have know for over 30 years. 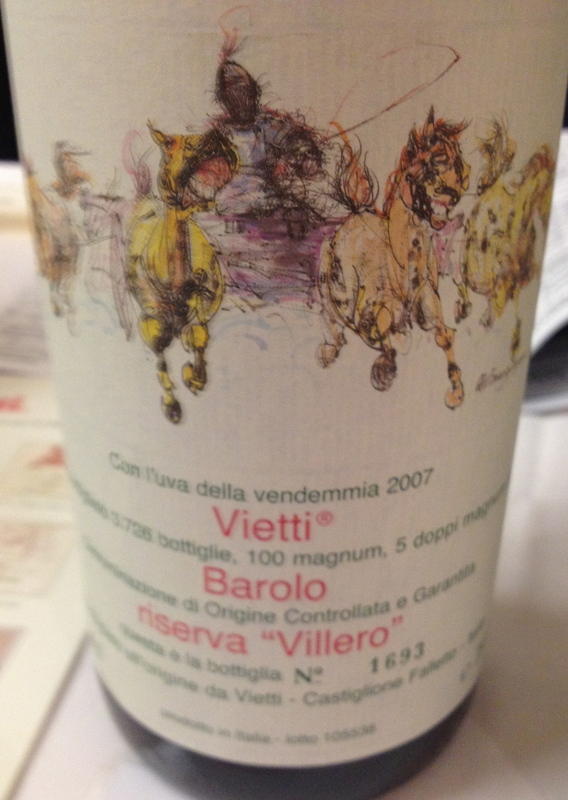 His 2007 Barolo Villero was the 2015 Gambero Rosso red wine of the year. Next was a visit to my favorite maker of Chianti Rufina Grato Grati. 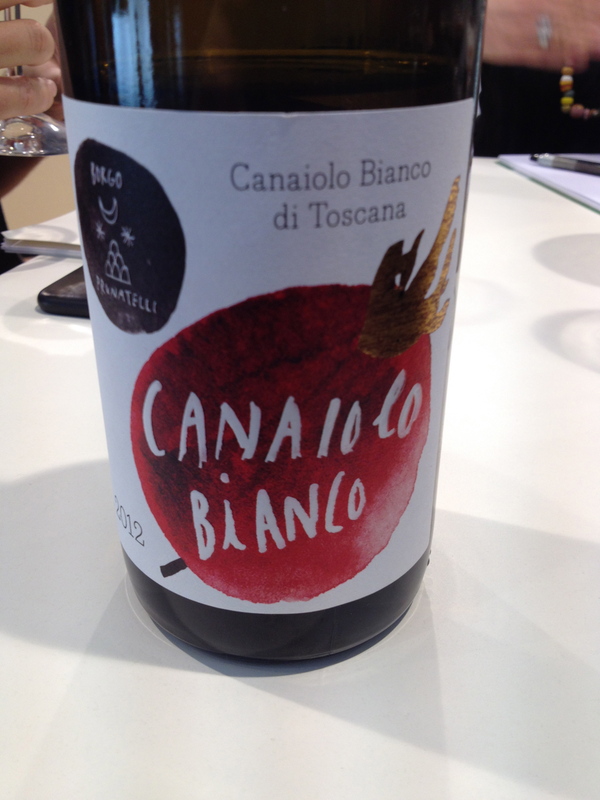 We tasted the Chianti and then tasted a wine I have never had before, a Canaiolo Bianco di Toscana. It was very good. 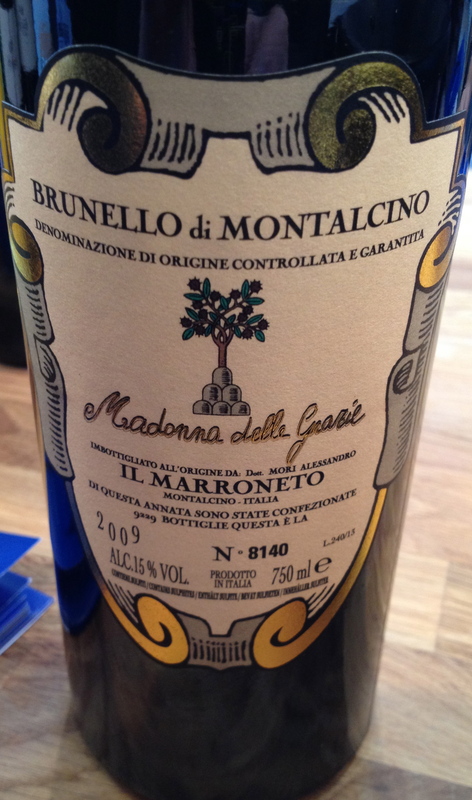 Riccardo Gabriele does PR for Italian wines and one of his clients is Il Marroneto, producers of a traditional Brunello di Montalcino, Madonna della Grazie, which I believe is one of the best Brunellos made. 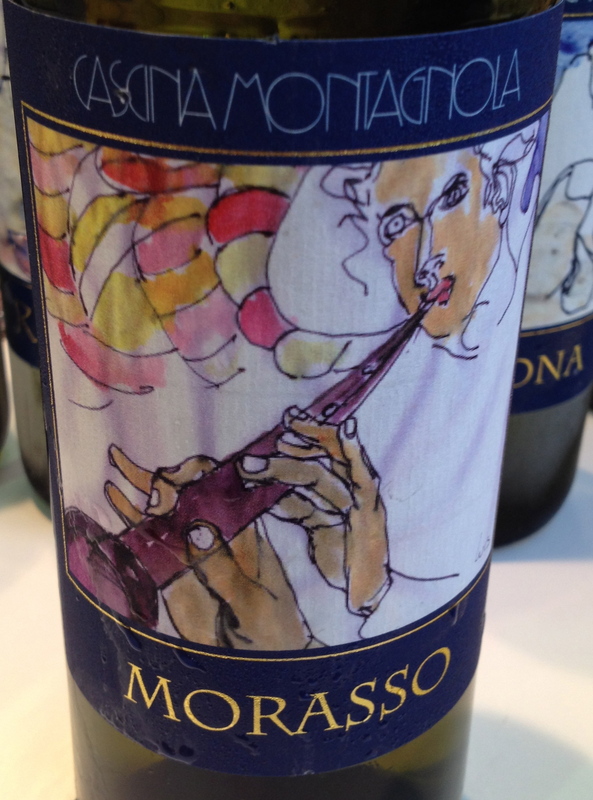 A Facebook friend, Steven Giles, suggested I visit Donatella Giannotti of the Cascina Montagnola winery. We tasted the Colli Tortonese Cortese and two wines made from the Timorasso grape, Dethma and the Morasso. 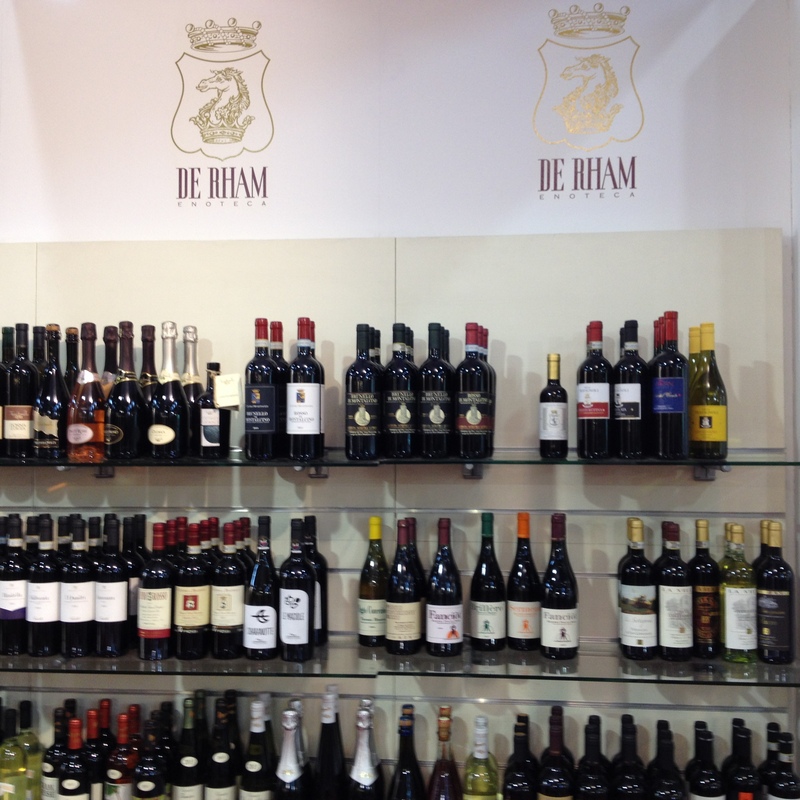 They are looking for an importer in NYC and I highly recommend the wines. Then we visited Dr. Alfonso and Anna Arpino of the Ag Az Monte Grazia Biological winery in Tremonti high above the Amalfi Coast. They make three wines–a white, a rose and a red, and are among my favorite wines. Next we visited the Machesi Bartolini Baldelli of Fattoria di Bangolo in Tuscany. I have know the Marchese for a number of years and when Michele and I were at the fair or in Florence we would go out to dinner with him and his wife. His wife is from Scarsdale, NY. We also stopped by to visit marketing specialist Marina Thompson and her husband, wine authority Daniele Cernilli, known as Doctor Wine. 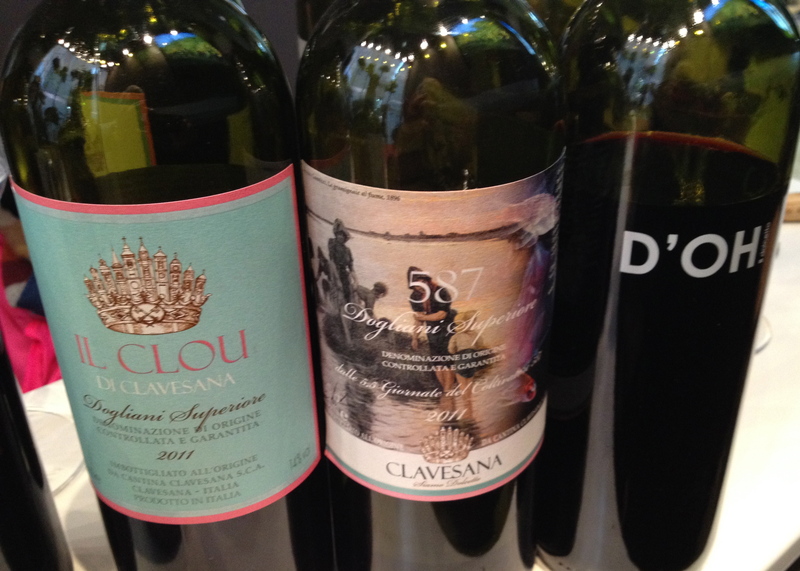 Our last visit was to Clavesana, makers of Dolcetto in Dogliani. We talked with Anna Bracco and Mario Felice Schwenn from the winery. Siamo Dolcetto meaning “We are Dolcetto” is the slogan of this large co-op. They said that Dolcetto is no loner required on the label, all it has to say is Dogliani, where the wine comes from, to know it is Dolcetto. We only spent two days at the fair, because as with so much in Italy, lunch comes before anything else! Michele was in a taxi, on her way home from Denver where she was at ‪#‎Craftsy‬ filming ‪#‎slowcooker‬ cooking classes. The video, featuring 7 lessons and 12 recipes from ‪#‎TheItalianSlowCooker‬,‪ #‎TheFrenchSlowCooker‬ and ‪#‎TheMediterraneanSlowCooker‬ will be available in February or March. Stay tuned! She told me to put up the water for pasta and and to reheat the sauce that she left. She said that she wanted red wine. I picked one of our favorite wines from Campania. The wine is made from 90% Tintore di Tramonti from very old ungrafted vines and 10% Piedirosso. The Tintore di Tramonti gowns almost exclusively in the Monte Lattari Valley. The grape is harvested at the end of September, which makes it an early ripener for this area. This indigenous red grape variety belongs to the Tienturier family. Tienturier means dyed or stained in French. The flesh and the juice of these grapes are red in color. The anthocyanin pigments accumulate in the grape berry itself. The free run juice is therefore red. This is a complex wine with earthly aromas, red fruit and a slight hint of black pepper, leather and spice with good acidity that makes it a very good food wine. This wine has ageing potential. I had the 2009 with the owner of the winery, Dr. Alfonso Arpino, on the Amalfi coast last year and it may be the best wine he has made so far! $30. One of the things I enjoy most about the Italian wine dinners I host at The Westchester Italian Cultural Center in Tuckahoe, NY is the opportunity to work with my friend Louis Coluccio, the proprietor of A.L.C. Italian Grocery in Bay Ridge, Brooklyn. Louis prepares the delicious food and I match it with the right wine. For our most recent event, we discussed the food and I selected some of my favorite wines from Campania. 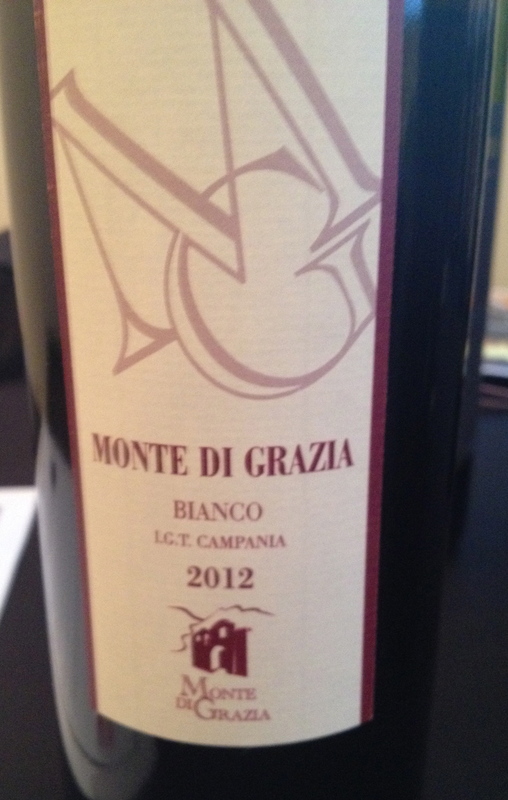 Monte di Grazia Bianco IGT 2012, made from the following local grapes: Pepella has only a few large grapes on the bunch, the rest being the size of peppercorns, though they all ripen at the same time. Ginestra, the name comes from the yellow-green color, which is similar in color to the gorse flower. Bianca Tenera (Biancolella) a local white grape. The wine has hints of citrus with undertones of pear and almond, a very nice mineral character and good acidity. It is fermented and aged in stainless steel tanks. $20 This was served with a Raw Kale Salad with Roasted Vegetables. DonnaChiara Greco di Tufo 2012 DOCG, 100% Greco di Tufo. The soil is tuffaceious and the training system is espallier. There are 3,300 plants per hectare and the harvest takes place during the second week of October. The grapes are not destemmed or crushed prior to pressing and there is cold fermentation with extended maceration. No oak is used. This is a wine that needs at least 5 or 6 years of bottle age before it is ready to drink. It has nice citrus aromas and flavors, a hint of smoke and a touch of almonds in the finish and aftertaste. $18 With this we had Crostini with Eggplant Caponata. This was served with Assorted Imported Salami & Fresh Figs. Az. Agr. Apicella Colli di Salerno Piedirosso IGT 2012, made from 85% Piedirosso from ungrafted vines and 15% other red grapes. There are 3,000 vines per hectare and the training system is mostly pergola. Harvest takes place the third week of October. The stalks are removed and the grapes are pressed. Temperature controlled fermentation in stainless steel tanks for 10 to 12 days. Piedirosso is used mostly as a blending grape. It is difficult to find wine made from 100% Piedirosso but worth the effort. The wine has fresh red fruit flavors and aromas with hints of black pepper and spice, a long finish and nice aftertaste. The wine should be drunk young. It goes extremely well with dishes made with tomato sauce. It is a steal at $16. This was served with the Pasta with Pesto Arugula and Cherry Tomatoes. Az. Agr. Monte de Grazie Biological Winery Rosso 2008 The wine is made from 90% Tintore di Tramonti from very old ungrafted vines and 10% Piedirosso. The Tintore di Tramonti grown almost exclusively in the Monte Lattari Valley. The grape is harvested at the end of September, which makes it an early ripener for this area. This indigenous red grape variety belongs to the Teinturier family. Teinturier means dyed or stained in French. The flesh and the juice of these grapes are red in color. The anthocyanin pigments accumulate in the grape berry itself. The free run juice is therefore red. This is a complex wine with earthly aromas, red fruit and a slight hint of black pepper and spice with good acidity that makes it a very good food wine. This wine has aging potential. $30. We ended with an Assorted Cheese Board which included ricotta salata, aged provolone, and other Italian cheeses.